On a pleasantly sunny late summer afternoon, with no sense of impending doom, I answered the doorbell, to be greeted by THIS!!! 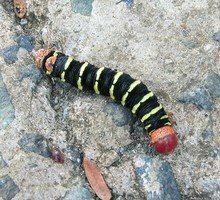 Now admittedly, that is a gorgeous caterpillar, but, when you're a serious plumeria collector with an extensive collection, this sight can strike fear in your heart! 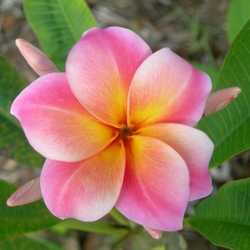 It is (drumroll please) the caterpillar of the Tetrio sphinx moth, and its primary host plant is ... plumeria! 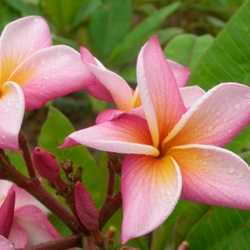 The sample, safely enclosed in a Ziploc baggie, was presented to me by a couple who had recently moved to our neighborhood, and with whom I had struck up a conversation on the topic of the beautiful plumeria tree in their front yard. We instantly became friends when they assured me they LOVED the tree and had no intention of bulldozing or otherwise damaging it in their efforts to renovate the house and garden. 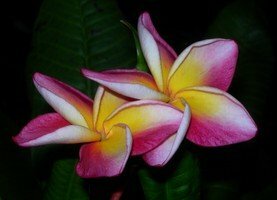 When they discovered this creature munching on the leaves they immediately decided to turn to me for advice, upon which I instantly picked up the phone and called my plumeria guru, the owner of a nursery specializing in plumeria. ‘These creatures will defoliate your collection in a matter of days' he warned ' and when they are done eating the leaves, they will start on the branches...The only thing to do is to pick them off by hand' he said, and ‘watch out, they bite!' so I grabbed a pair of gloves and followed my friends over to their house. 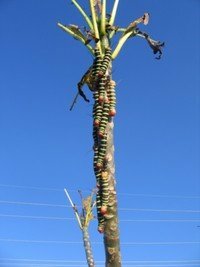 It was worse than I had imagined; the large fourteen foot tall tree was crawling with these six inch monsters and I imagined hearing their jaws chomp, as they steadily devoured leaf after leaf. Our attempts at blasting them with a water hose - another suggestion my friend had made when he heard about the size of the tree - were laughed off by the tenacious beasts. So - we got a ladder and went up. ‘Got one' my friend called, and I picked the fallen creature up off the ground and deposited it in a bucket. The mental image of this horde invading my precious plumeria patch did away with my usual peaceful nature. I had to get rid of these! 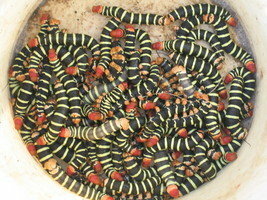 It was a frustrating task since, despite their vivid coloring, the caterpillars managed to hide very effectively in the dense foliage, so in order to see them properly we got out the secateurs and started clipping off leaves. This proved quite effective and our tedious task progressed with increased speed. Several hot, sweaty and sometimes frustrating hours later daylight was fading; we had collected about twenty-five caterpillars and I was ready to call it a day. At that point none of us could detect any more of the hungry creatures. At noon the following day my friends called to say that they had found another four, and felt they had now removed all the caterpillars from the tree. 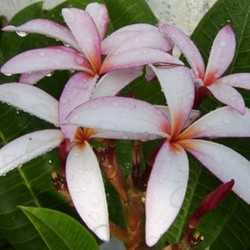 Needless to say I very, very carefully checked my plumeria patch for any sign of the herbivorous horde in the ensuing weeks, but I am happy to say so far none have shown up here, nor have any more been seen in my friends' tree. This event was my second meeting with these strikingly colored creatures; the only previous time had been when our nursery friends had brought a few for ‘show and tell' at a plumeria get-together. They are fortunately rare in Florida and I hope - for the sake of my collection - not to encounter them again! and my thanks to the authors, and to the University of Florida, Entomology and Nematology Department for allowing me to use their material. Also thanks to Florida Colors Nursery for advice and pictures.